In the last six years, our family has increased by six children. We describe it as “our DYNAMIC family” - characterized by constant change and activity - and we love it. As you would expect, as God was enlarging our family and giving us these beautiful kids, we have learned a whole lot about adoption, that is, the act of humans bringing other humans into their family. What I hadn’t considered was the understanding the Lord would reveal regarding our spiritual adoption, as when God the Father, the Creator, the Sovereign Lord brings HUMANS into HIS family. How marvelous, how awesome, how beautiful!! Let me first share with you, what we’ve learned about humans adopting humans. In the OT, there were three “adoptions” mentioned, Moses, Esther and someone you probably don’t hear of often named Genubath. (1 Kings 11:20) Israel is called God’s son as well but the word ‘adoption’ does not appear in the OT. It’s the apostle Paul who first uses this wonderful word and he borrows it from the Roman legal system. The adoption laws of the western world are based on this same Roman legal system, though I think you will see that it’s NOT humans that have given the fullest expression of adoption, but God adopting humans is not only the basis for human adoption but the core of the Gospel itself. The word Paul uses, in Greek, is ‘huiothesias’. I remembered enough of my college Greek to recognize the first stem in that word, ‘huios’ as ‘son’. ‘Huios’ is the beginning of the word for adoption, ‘a son’ and the second half means ‘to place’ so literally, huiothesia means ‘to place a son.’ In Roman law it meant to place a son, not naturally born to you, into your family, as an heir, with all the same privileges, benefits, positions, responsibilities and obligations as a natural born child. Now regarding gender neutral language, when I read in Galatians 4 “that we might receive adoption as sons” I am tempted to paraphrase this to “as sons and daughters”. But if you know a little about Roman law OR if you’ve watched or read “Sense and Sensibility” or any of Jane Austen’s stories of Regency England, then you know that it was only the adult sons that became heirs, with all the rights and privileges - NEVER the daughters, so if Paul had said “adoption as sons and daughters” it would have lost all meaning. Men, God has adopted you as sons if you are in Christ. Ladies, God has adopted you as sons, if you are in Christ. We have full and unalterable privileges as adopted adult sons, if we are hidden in Christ where there is no male or female. I want to spend the rest of this article sharing six observations that we’ve had in the experience of adopting and then I want to demonstrate how these characteristics form the core of the Gospel and so, I’m going to run through this list of six observations TWICE. That means if you are planning on a three point sermon, you’ll be getting FOUR times your money’s worth. 1. Adoption involves seeking and serious planning. I always believed and even planned, that I would be at peace when our older daughters left home and I would finally be able to go into my study, with walls made from ALL my books, and just sit and read that stack of MUST READ books I was building. Teresa and I would travel to exotic places in search of the perfect Tirimisu. When the time came, the Lord didn’t grant us peace, Teresa and I were restless - child rearing had ended too soon. We had the privilege of watching Teresa’s older bother and his wife adopt 6 girls from around the world and Wisconsin and we enjoyed spending time with them. 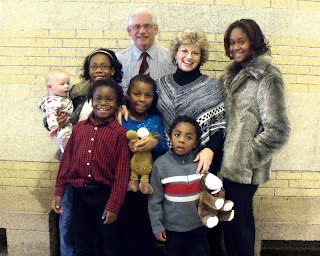 We thought about the possibility of adopting and on Christmas day in 2005 we even felt called to seek out our children. Children we hadn’t seen yet, but children we already loved. We made connections with the Foster Care system in the state of Wisconsin and met for interviews in which our entire history and philosophy was laid bare and recorded. We gave up our privacy and confessed every secret we had so that strangers could test our worthiness. The police, the Sheriff’s department, the FBI took our finger prints and ran checks on our backgrounds and then we waited to be certified. This was a very serious undertaking. Adoption involves serious seeking and planning. On the rumors of 3 little boys we hit the yard sales and bought enough clothes, toys and roller blades to get three boys from birth to college. On word that it was between us and another couple we hit the stores to price bunk beds. Watching the checkbook balance carefully I juggled the budget, we’ll get the money, we’ll find the money some how, these are our kids. On word that there were 3 different kids in immediate risk, a boy, a girl and another girl and we have 20 minutes to decide we pushed the latent image of 3 boys out of our minds and considered a boy and two girls, ages 2, 5 and ‘we’re not sure’. At least the roller blades were gender neutral. Today, we have six kids at home, our grocery bill has exploded, our house is out of storage space, I’m building a new bedroom, our van doesn’t hold us all at once. Adoption is costly. Consider their hair care alone. Those twists and braids don’t just happen. It’s not just financial, it’s also emotionally stressful and it requires time. I can summarize the financial cost, the emotional stress and the time involvement in one word - DIAPERS! The life of a diaper is ridiculously short and it’s death is smeared with dishonor and disgrace. How tempted I have been to call the people who handle hazardous material for a living but the budget wouldn’t allow it. Adoption is costly. 3. Adoption involves a change in moral values. JB, Luc, Emie, Théo, Rosie, Claire, you are Vigneaults, our family has certain values that we uphold. We learn the Ten Commandments because our heavenly Father values these things and as his children we do not want to bring shame upon His household. You will learn our values and respect one another and avoid bringing shame to our household but if you fail... and you will fail, we have a Savior. We are saved by His grace, by his work, by his righteousness, by his blood. Adoption involves a change in moral values. 4. Adoption, often removes a child from very bad situations. I’m not going to go into the details here but suffice it to say my children have seen the results of human depravity, the worst of those who by nature are God haters, who seek their own and who glory in their shame. Taken out of a world of drugs and addictions, of crime and violence, that lacks in any kind of ethical foundation. There was one evening when Teresa and I were leaving in the car and Luc was expressing anxiety to Emie over whether we would return and would they would be able to eat. Luc wasn’t thinking like a son yet but still as a slave to fear. Emie quickly explained, “Don’t worry, these people won’t let us be hungry. They’ll come back and they will feed us.” Adoption, often removes a child from very bad situations. 5. Adoption involves a legal, unalterable act. After giving the biological parents time to change their destructive behaviors which had placed our children at risk, there was a legal proclamation to terminate the rights of the parents (according to the flesh). Then after a time of appeal we went to the courthouse and a smiling judge - you don’t get to see judges, especially family court judges smile much - a smiling judge pronounced a decree of adoption. It is a very exciting moment. The judge said, “Mr. and Mrs. Vigneault, do you understand that this adoption decree will establish the relationship of parent and child, together with all the rights, responsibilities, and duties, between you and Jean-Luc and Noèmie and Jean-Théodore?” Yes we do. “Do you understand that from this day forward, Claire-Terese, Rosalie, Jean-Baptiste are entitled to inherit real and personal property by, through, and from you and has the same legal status, including all legal rights and obligations of any kind whatsoever, as a child born to you?” Yes we do. The judge pronounced the decree of adoption in accordance with the law and it was DONE. 6. Adoption changes one’s history. At this point, and before we took pictures of our family WITH the smiling judge, the court clerk called me over and asked for an $86 check to cover the cost of birth certificates. Yes, I said birth certificates. Isn’t that wild? A week later the birth certificates showed up. There was the name of the hospital and the date of birth and even the attending nurse, but where the baby’s name was, there was the new name of our new child - on the lines where the parents names were, there were OUR names. A judge pronounced a decree and it generated a birth certificate that changed history. Who our children were, and if they had any debts outstanding, it no longer mattered, everything was brand new. That is a brief recounting of some of the remarkable attributes of human adoption but adoption finds it’s truest expression in the act of God adopting humans so allow me to run through this list again, with our eye on the Father. he (God) chose us in him before the foundation of the world, that we should be holy and blameless before him. In love 5 he predestined us for adoption as sons through Jesus Christ, according to the purpose of his will, 6 to the praise of his glorious grace, with which he has blessed us in the Beloved. 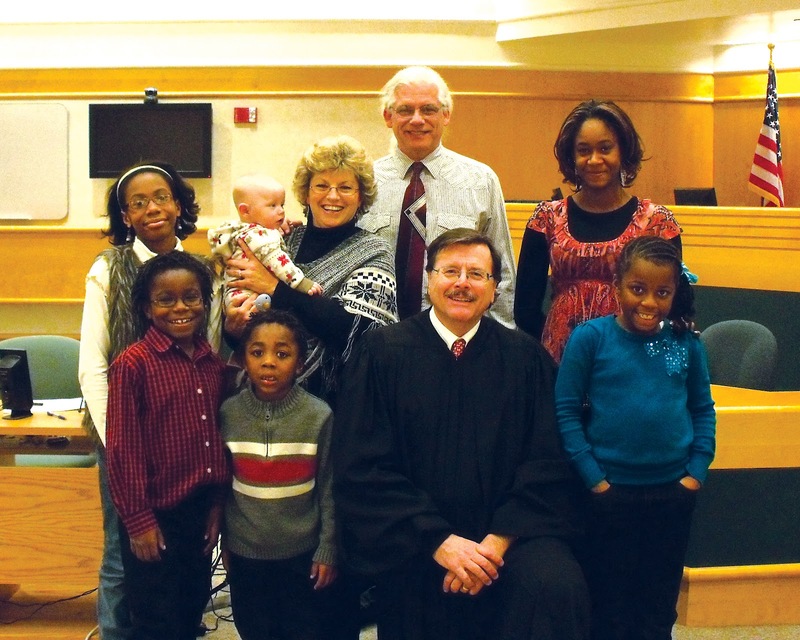 Even before the fall, God had planned our adoption. God ordained, from the beginning, the creation, the fall, our redemption, our adoption so that his adopted children would know the full range of God’s glory and mercy and grace. That’s what he did in eternity past, but in the fullness of time, as he promised Eve, “he sent forth a Son, His Son, born of woman, born under the law to redeem... so that we might receive adoption as sons.” Our adoption involved serious planning. “But when the fullness of time had come, God sent forth his Son, born of woman, born under the law, 5 to REDEEM!” To redeem! To purchase, to buy back, to erase the debts, to pay the price in full. If you took all the money and possessions that I have and you have and Warren Buffet has and Bill Gates has and every precious thing in and on the earth, it couldn’t even begin to approach the worth of a single drop of blood that dripped down a rough cross on a Friday afternoon outside of Jerusalem nearly 2000 years ago. That old cross was soaked with that precious blood and worst than that, it pleased the Father to pour out the full measure of his anger on the one man... the only man... who didn’t deserve it. “My God”, the son cried, “My God, why have you forsaken ME?” Jesus Christ lived a perfectly obedient and righteous life under the law so that he could let you receive the credit... his credit... for HIS perfection. Jesus Christ took the punishment that should have been ours, he became our substitute, he became a CURSE... for us. Why? To reconcile us to the Father, to allow for us to become his true, real, brothers and sisters. There is no injustice in this world, that matches the injustice of God’s perfect and righteous son taking the punishment of sinners and counting us as those who have lived perfectly before God’s all seeing eyes. Our adoption was costly. 3. Adoption involves a change of moral values. Our adoption changes our moral values. The truth is as simple as it is painful: in Adam we have all sinned and God’s hates sin. He is more holy than we can comprehend and we are more sinful and sin filled than we would ever admit. We try and cover our sins with drugs, entertainment, music and even good works but in our deepest core we know that apart from Christ we are dead men walking. The chasm, morally and culturally, is too great for any man’s attempt to cross it. How can I go to God??? I can’t! We can’t!! But he has come to us. God sent forth his Son. God was not obligated to save anyone. God would have been perfectly just to leave us to our own destruction but God saves sinners. In Adam, I was dead but in Christ I am his son, his heir with all the privileges. Adoption by God, ALWAYS removes a child from a very bad situation. Galatians 4:6 includes the phrase “And because you ARE sons.” You see, something happened. There was a decree of adoption and it changed everything. Legal matters had to be attended to. God’s own law demanded that we be punished and EXCLUDED from his presence. That would have been justice. God had to satisfy his justice and he did it through the life, death and resurrection of Jesus Christ. Now here is the important part. He didn’t wait for you to begin acting like his child before he took legal action to adopt you. Read that again! You didn’t clean up your life or in any way earn the right to be adopted. God, unilaterally, took action and pronounced His decree of adoption while you were still a sinner. He adopted you first, and it was then that you began to enjoy the privileges and benefits of sonship. That is remarkable! That is God’s mercy and grace. Our adoption is a legal and unalterable act - no man can change it. 6, Lastly, adoption changes our history. The Lord, the Lord, a God merciful and gracious, slow to anger, and abounding in steadfast love and faithfulness, 7 keeping steadfast love for thousands, forgiving iniquity and transgression and sin, but who will by no means clear the guilty, visiting the iniquity of the fathers on the children and the children's children, to the third and the fourth generation. My father Adam ran up some debts. My father Adam, passively stood by while my mother Eve was seduced by a smooth talking serpent. My father Adam willfully did the very thing that the Creator told him not to do. My father Adam in his shame, tried to cover up his debt with fig leaves. How dumb is that? I am embarrassed for him. He was a fool. The Creator had every right to skin my father Adam alive and spread his blood all over the garden. Instead, the Creator made a temporary substitute of an innocent beast and shed the innocents blood and covered my father Adam temporarily. My father Adam passed his debts on to his sons, and they to their sons and so on and so forth. Throughout history, my ancestors shed the blood of innocent animals to temporarily hide the debt that kept on increasing. Every generation added to the debt. I inherited that debt, I inherited my father’s passivity, and no matter how much I tried to pretend that I didn’t owe the Creator anything, my conscience testified against me. How can a man of sin, the son of law breakers, a man steeped in debt, whose father Adam, in one act of defiance, turned the entire world into one gigantic ORPHANAGE, approach a holy God? There is good news, the Creator has provided a way. The Creator has planned and sought... he has paid a costly and awful price... he has sent his spirit of adoption to remove you from a bad situation... he has satisfied every legal demand... and he has changed your history. Dear brothers and sisters in Christ, if an earthly judge can offer a legal pronouncement powerful enough to generate a NEW birth certificate, consider the power and assurance behind the words of the Judge of the universe, the Creator, the Sovereign Majesty whose authority dwarfs every and all others. When God says that you are adopted as sons, he is not giving you an illustration to help you to understand salvation, his adoption language is NOT an analogy; when the Father says you are his adopted child he is describing a real and legal and unalterable relationship. You are really his child NOW!! !, with all the benefits, privileges and position that goes with being a child. You may even call him “Abba”, “Father”. We, the church, are REALLY brothers and sisters with all the obligations and responsibilities that brothers and sisters have to each other. I don’t call you brother or sister because your my friend, or because I can’t remember your name. I call you brother and sister because we have been adopted by the same Father and hidden in the same brother, we are members of the same household. There is a man in your church who is a bruised reed - he is one fiber away from breaking - he is not your neighbor, he is not your friend - he is your brother. Our Father expects you to go to him, hold him up and strengthen him. There is a lady in your church who is a faintly burning wick - she is one small spark away from being quenched. She is not your neighbor, she is not your friend - she is your sister. Our Father expects you to go to her and see that her needs are met. You have just heard the gospel proclaimed. All of that talk of sin and our inability to save ourselves is the bad news and I won’t try to soften the truth. You, like every child of Adam, deserves eternal punishment for your sins. There is no salvation outside of Jesus Christ. Mohammed and Allah can’t save. The Bhudda can’t save. Any system of belief that holds Jesus Christ lower than Almighty God, through whom the world was made and who has all authority in Heaven and on earth, that belief will not save you. If you want to trust in your own good works, no matter how good you try to live, your good works will never be good enough. That is the bad news. But here is the good news, if you confess with your mouth, that Jesus is Lord and believe in your heart, your core, that God raised him from the dead.... you will be saved. You don’t have to live and die an orphan. God has prepared a home for you. I was greatly helped in outlining and organizing this article by a resource from Dr. John Piper, “Adoption: The Heart of the Gospel”, http://www.desiringgod.org/resource-library/conference-messages/adoption-the-heart-of-the-gospel and by Dr. Russel Moore’s excellent book, “Adopted for Life”. Thanks for the article! So happy for your family. As you know, adoption has a special place in our family's heart as well. Praise God for his wonderful plan of adoption. I came across your blog just a little while ago and was blown away. I loved this post. Terrific writing, and amazing, heartfelt sentiments. I love to find Christian blogs that are both well-written and informative. Yours doesn't disappoint.